Yes, another Firefox extension post this week but bear with me for a minute and you will see why I am so excited about this particular one! 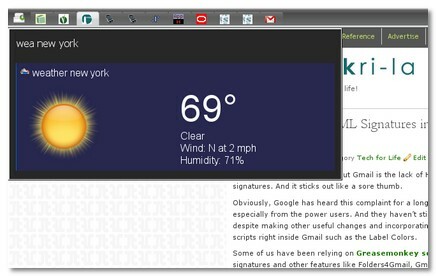 Ubiquity is an experimental Firefox extension that takes web browsing to the next level. It’s easy to draw a parallel to Ubiquity of you are used to using an application launcher such as Launchy or Humanised Enso (Enso review | Enso Commands). Application launchers such as those lets you get to your applications with a few keystrokes without having to go look for i t through a menu maze to find the one you need. I use Enso in Windows and Launchy in Linux. Now, you can make Firefox do what you want it to do with a few commands through Ubiquity. It already comes with a set of commands that make common Web tasks faster and at your fingertips. Install Ubiquity extension just as you’d install any extension. Ubiquity is supported on Windows and Mac but not fully supported yet with Linux. But, I have been trying it out in OpenSUSE 11.0 and it works great so far. You need to hit the appropriate keys to open Ubiquities command line that will pop open as a black box on the left top corner with a blinking cursor. Once, you have the box now you are ready to start issuing commands. The commands just correspond to common things people do on the Web such as look up an address in Google Maps, find info in Wikipedia, search Google, look up weather, translate a word, etc. If you have Ubiquity installed, you can view the current commands available to you here. Lets try a simple look up of weather in New York. In Linux, I hit alt-space and then type wea and it is already showing the different options and ‘weather’ is one of them and is highlighted. So, I just hit space bar and type New York.That’s it and it brings up weather in New York. tinyurl – I am going to love this as I am a heavy tinyurl user. Just need to select a url and issue this command! As you can see, you can save so much time by not going to the location bar to get to the website you need and then searching for the stuff you need. You do it with a few key strokes with Ubiquity. As with many good things, there will be a conscious change in the way we do things but this one of the things I know for sure will better my experience in the Web. You could also checkout this Ubiquity intro video or read this user tutorial to get a better idea on what it can do. You are probably wondering if it’s a Firefox add-on review week instead of my usual Firefox Extension Picks. But, yesterday’s review of Black Canvas Gmail Signatures needed special attention and that’s the least I can do for such a useful tool that I’ll use everyday. Similarly, I am so excited about Ubiquity I had to give it due diligence and share my excitement with you. I hope you try it and see if you like it and helps with your time on the Web. Let me know how you liked it in the comments. Ubiquity 0.2 is due out soon and I am excited to see it. Definitely looks good, I used another tool called Kallout (http://techie-buzz.com/utilites/web-search-using-word-excel-powerpoint-outlook-notepad-and-pdf-files.html) which integrated more into Microsoft products and browsers so will stick with that for now. Though will definitely try this out once it gets more stable. I would suggest you try out kallout too and see for once. Keith, I just checked out your post on Kallout and it looks great and I will try it. 🙂 Thanks for sharing that. Andrew, great to hear you are having fun with it too. Auto-smart completion is something very nice plus you can scroll through different options with your keypad. The features looks amazing. Will give this a try right now. It’s nice and great firefox addon. With Ubiquity,no need to switch or open new window/tab,all network application can do in one webpage as mashups mentioned by Mozilla Lab. We need to think that web browser no only for view,it also need edit and manage application in future. Ubiquity and Firefox is the best combination. Madhur, would love to hear how you like it. Wongsk, Ubiquity just raised the bar in the browser area making Firefox absolutely awesome and useful. Even with the release of Google Chrome browser, lot of Firefox folks are still standing by it. And for a good reason. Thanks for the tip. I will try this out. It looks very useful for quick searching.